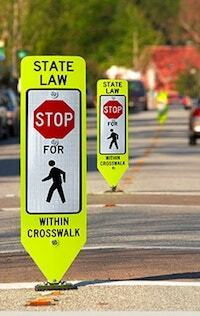 Drivers see the sign and slam on their brakes to allow pedestrians to cross the street. Pedestrians see the sign and shake their fists at drivers who don’t stop for them. Drivers are confused; pedestrians are confused. Let me un-confuse you. Cars must stop for pedestrians who are WITHIN the crosswalk. Cars do not have to stop for pedestrians AT the crosswalk, standing on the curb. Ok – so now you are un-confused and understand the law. But, let’s be perfectly clear: JUST BECAUSE YOU’RE IN THE CROSSWALK DOES NOT MEAN YOU’RE SAFE. Dangerous crosswalk situation #1: Car A is approaching the crosswalk within the speed limit when a pedestrian suddenly steps into the crosswalk and Car A is unable to stop. Who is at fault? The pedestrian, even though he was in the crosswalk. The law states that a pedestrian cannot walk into the path of a vehicle which is so close that it is impossible for the driver to yield. Dangerous crosswalk situation #2: Car A has stopped for a pedestrian within the crosswalk; the pedestrian crosses in front of Car A only to be hit by Car B in the next lane. Who is at fault? The driver of Car B. In this case, although the pedestrian may have walked into the path of Car B which could not stop in time, Car B failed to noticed that Car A had stopped for a pedestrian within the crosswalk. See what I mean? No matter who is at fault, the pedestrian, unfortunately, is always the loser. “Pedestrians have the right of way” is only sometimes true. “Pedestrians always get the worst of an accident” is ALWAYS true. Pay attention - Put down your phone and pull out the earbuds when crossing the street. Stay up on the curb to wait to cross - It’s safer. Although cars must stop and allow you to cross if you’re standing IN the crosswalk, it’s dangerous to be waiting in the street. Wait for the all clear - Even if a car has stopped to allow you to cross, my advice is to wave it by. Just because one driver has stopped for you doesn’t mean you’ll be safe to make it all the way across. You may get hit by a second car. Cross quickly – once you are in the street, you have no protection. Get out of harm’s way ASAP. Cross when the light says WALK, not when the light is green for traffic. If your light says DON’T WALK, there’s a reason: drivers may have a green arrow to turn. Remember that corny joke: “Why did the chicken cross the road? To get to the other side.” Well, getting to the other side safely is not so easy anymore.